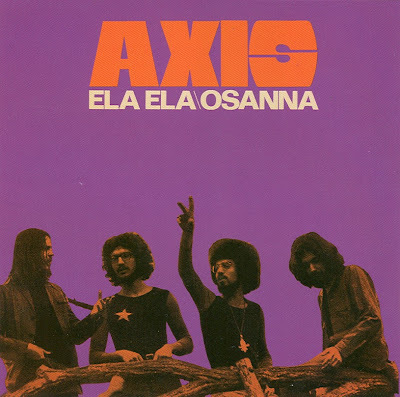 Axis united musicians from late sixties groups, among them Juniors and We Five. Like Aphrodite's Child they were based in Paris for some time. In the beginning, Axis played archetypical heavy progressive rock with great organ and electric guitars. Be aware that the 1971 and 1972 releases essentially are the same album! Their classic 1973 album marked a considerable change of direction - an advanced kind of jazz-rock with a lot of improvisation. A couple of tracks were even in line with the British mellotron-rock tradition (King Crimson, Gracious and Spring). DEMIS VISVIKIS: Harpsichord , Piano, Organ & Lead vocal. GEORGE CHATZIATHANASSIOU: Drums, Percussions, vocais. ALECOS CARACANDAS: Lead guitar, Acoustic guitar, vocals. DEMETRIS KATAKUZINOS: Acoustic guitar, Bass, Lead vocal. Thank you for sharing. Keep up good work.